AIRO -- It takes five seconds. By the time he opens the passenger door, swings out his legs and stands up, the kids swarm. Some are as young as grade schoolers, others are teenagers. One boy wears a blue NAPA hat. Another a black Superman T-shirt. All the girls have their heads wrapped in colorful scarves. 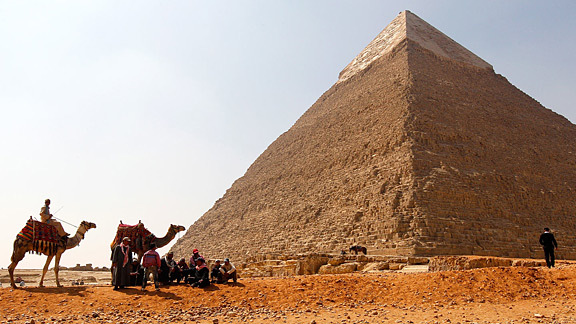 The kids are likely here at the famed Pyramids of Giza on a school field trip. But on this sun-filled morning, the main attraction isn't the Sphinx or the Great Pyramid. Instead, it's a determined-looking American, a bald man wearing dark blue jeans and a plain gray T-shirt with beads of sweat soaking through the fabric. It's Bob Bradley. Since accepting the job as manager of the Egyptian national team last September, the former U.S. coach, a man who had been ridiculed stateside for being too boring and too robotic, has become an A-list celebrity in soccer-crazed Egypt. His commitment to his new country and his response to its post-revolution challenges have endeared him to a population that wrestles every day with the concept of leadership. Now, the man can barely step outside his Cairo apartment without someone begging for a photo. THE BOY IS DYING. He lies on his back on squares of sparkling white tile in the Al Ahly locker room, fighting for every last second. Mohamed Aboutrika, the most beloved player in Egyptian soccer, rushes to him, kneels down and takes the boy in his arms. A postgame riot has brought the two together. The chaos on this February night in Port Said began moments after the match between Cairo's Al Ahly and its rival, Al Masry, as fans set upon one another with rocks, broken bottles and knives. When the stadium lights mysteriously flickered off, the riot police chose to stand by. The result will be the most gruesome tragedy in Egyptian soccer history: 74 dead. A thousand-plus injured. Millions outraged. Some of the wounded rush to the Al Ahly locker room for help. It soon resembles a MASH unit: Injured and dying are everywhere, at players' lockers and in the hall. The dead lie on the floor amid duffel bags and dirty socks. At the center of it all is Aboutrika. Al Ahly is Egypt's version of the Yankees; Aboutrika is Derek Jeter, an aging superstar who commands respect, a hero to fans. The dying boy on the sparkling white tile is one of them. He wants to see Aboutrika, touch him, so the player leans closer as the astonished boy says, "Captain." Read "The Crucible in Cairo." 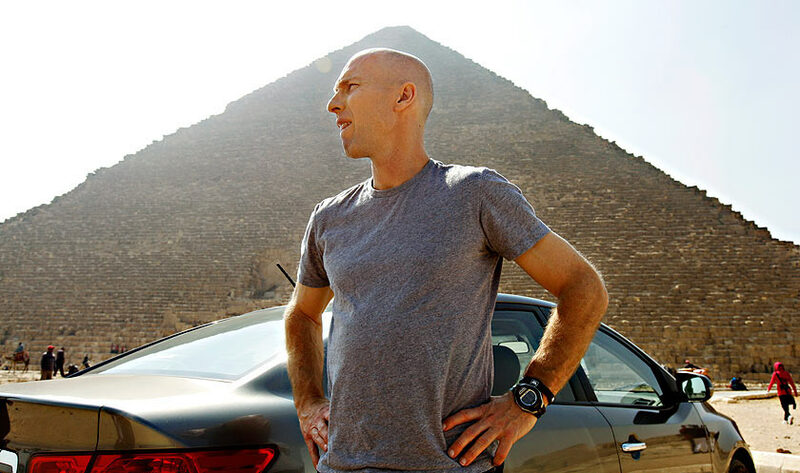 Children and fans surround Bob Bradley during his visit to the pyramids. Bradley wouldn't typically hang out at the most popular tourist destination in this or any other country. But today, he's doing it for a specific reason. In February, Bradley watched on television as 74 fans were killed and thousands more injured after a postmatch riot in the Egyptian Premier League. The horrific scene in Port Said was broadcast around the world. It left me wondering why Bradley was in Egypt, and what life was like in such a tumultuous post-revolution world. We talked by phone, and he insisted things weren't nearly as chaotic as they seemed. He spoke about the warmth of the Egyptian people, and invited me to come to Egypt and see for myself. From the moment I landed in the Middle East, Bradley raved about the pyramids. How my jaw would drop. My eyes would widen. How it would be unlike anything I'd ever seen. If I'm going to understand and appreciate Egypt, he said, the pyramids are a must. Just to make sure I don't miss them, he takes me there himself. When our tour begins, Bradley stops our guide midsentence and turns to me. "You getting some of the history here?" he asks. "This is pretty incredible stuff." But bringing me here comes with consequences. Everyone wants a piece of the man they hope will take their country to its third World Cup in 80 years. Outside the Great Pyramid, grown men call to him atop camels. Others fill his hands with free souvenirs, which he later gives to me insisting I take them home to my daughter. And here by the Sphinx, it's that throng of school children who can't stop staring. Every kid wants his or her own 1-on-1 photo. Bradley tries to accommodate as many as he can. But he's tight on time. In every picture with a boy, click, he puts his arm around their shoulder. In every picture with a girl, click, he keeps his hands to himself. As one child poses for a picture, the boy says, "Cheeeeeeese." "They love that here," Bradley adds. As Bradley walks closer to the Sphinx, the pack grows. We've been at the pyramids for nearly two hours. Someone decides it's time to go. Bradley poses for a few more pictures and then endlessly repeats the Arabic phrase for thank you. "Shokron," he says. An assistant coach and an Egyptian Soccer Federation PR man usher him to his waiting car. When the door closes, he takes a deep breath. Then he chuckles. "It's wild around here, isn't it?" he says. Bradley then realizes he's bleeding from a tiny cut on the side of his head. He has no idea how it happened. He guesses one of the kids must have bumped him while holding a cell phone. As the car begins to pull away, Bradley touches the nick with his fingers to survey the damage. It's not a big deal. "Lindsay will get a laugh out of this," he says of his wife. Outside the car, kids cup their hands around their faces and press up against the glass to see inside the car. A boy yells to Bradley. "Thank you, thank you," the boy says in English. "Thank you, my friend." And just like that, Bradley is gone. Bradley takes in the scene at the pyramids. 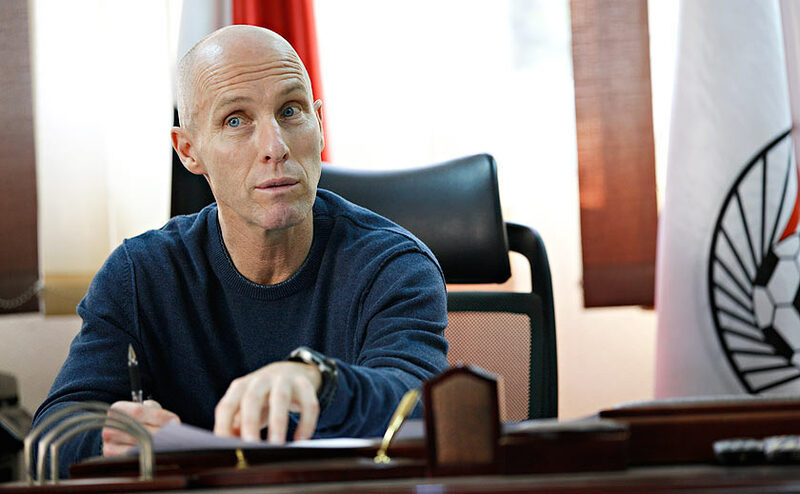 Bob Bradley is fuming. He sits behind the cherry desk in his office, bright blue veins bulging from the sides of his head. Each carefully chosen word that comes out of his mouth does so at a volume more deafening than the last. He raises his right hand high above his head, pauses and slams it on the desk, the sound of skin smacking wood making me jump. And if that isn't enough, just to make sure nothing is lost in some sort of cultural misunderstanding, Bradley explains: "I'm pissed off!" His day hasn't gone well. The shower in his apartment didn't work. The traffic-choked Cairo roads made him late for his meeting. 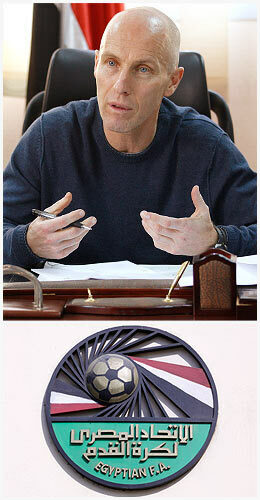 And he argued with Egypt's Olympic coach over a group of players they both want to train with their respective teams. Through it all, Bradley has stayed calm. A man in a bright red sweater changes that. When he walks into Bradley's office and tells him through a translator that the apartment Bradley's German fitness coach wants doesn't fall within the federation budget, Bradley snaps. "Budget? What budget?" Bradley yells. "Nobody said anything to me about a budget." For Bradley, a seemingly simple request to get his fitness coach an apartment causes great frustration. If he were at home, he would know where to turn. He'd know who he could trust, who he couldn't trust and how to get things done. Sizing people up -- that's always been one of his greatest strengths. But he's not in California anymore. Home is now the Middle East, where the Muslim call to prayer echoes through the streets five times a day. There's a different language, a different alphabet and an entirely new set of cultural norms. When Bradley's agent calls to ask if his client is getting what he needs, the coach laughs. "You don't get what you need here," he says. Last September, when Bradley accepted this job, he knew it would be the ultimate test of a personal navigation system that was a lifetime in the making. The Arab Spring and ouster of former president Hosni Mubarak left in their wake an unstable country with an uncertain future. Then there was February's brutal postmatch riot in the Mediterranean town of Port Said. Several of the players on the field that night were Bradley's most important stars. Since then, the Egyptian League has been canceled. The men who hired Bradley have all resigned. And the country's military rulers refuse to secure matches inside Egypt out of fear of another Port Said. His team has no home. His players have no league. His new country has no leader. It's no wonder Ahmed Hassan, Egypt's all-time leader in caps, said recently "God help Bob Bradley." The current task would seem simple enough. Find his fitness coach an apartment. But in post-revolution Egypt, nothing is easy. Bradley has been told that to get things done he needs to be harder on the Egyptians. But this early in his tenure, he worries about alienating those he might eventually need. So he picks and chooses his moments carefully. Apparently, this issue over the apartment is one of those moments. "Too long. Too long. TOO F---ING LONG," Bradley yells in his office. "Everything here takes too f---ing long." Bradley stands up from behind his desk, turns his back on everyone in his office and looks through a crooked set of beige and brown blinds. There is no view. The room is impersonal and barren, like Bradley's offices always are. The tall cherry cabinet next to his desk is empty. Twelve nails stick out of the walls with nothing hanging from them. They used to hold pictures of Mubarak posing with previous national teams. Not anymore. Listening to the Arabic conversation taking place behind him, Bradley thinks he hears what translates to, "this is Egypt." He hears this phrase a lot. He hates it. "We can't always say, "This is Egypt," the coach barks. "That doesn't work. This is wrong. It's wrong! Just like that, Bradley shuffles together a few papers on his desk, grabs his bag and walks out. It seems this might be a long night, that Bradley will stew over this confrontation for hours. But as soon as he walks through the federation doors, he looks at me and smiles. "Heck of a night to be here, huh?" I'm stunned. I wonder if it was all just an act. If it was calculated. Or maybe that's a secret of survival in this chaotic world. Minutes later, our car buried in five lanes of gridlocked traffic, Bradley is laughing again, this time with his driver Hani. There's a car up ahead trying to turn around and head in the opposite direction of more than 100 stopped cars. The driver is trying to accomplish the impossible. Bradley just shakes his head and laughs. "Look at this guy," he says. "What is he thinking?" 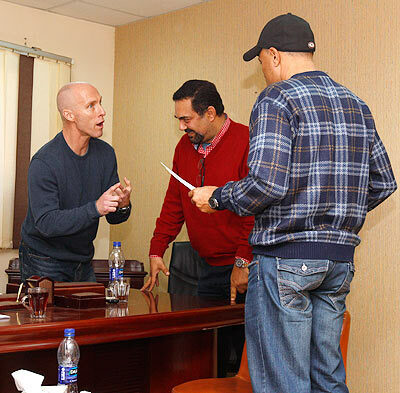 Bradley and his colleagues with the national team meet with Egyptian Olympic coach Hany Ramzy about player allocations. Late one night after dinner in Cairo, Bradley and I are riding back to the hotel when I ask what went wrong in his final months with the United States. For almost a week, Bradley has answered nearly every question. He's let me join him for team meals and ride the team bus. He's taken me all over Cairo, from the pyramids to a bazaar to a quaint Italian restaurant to which he and Lindsay frequently escape. But now, there's hesitation. As our car makes its way toward the hotel and the lights from Cairo's tire shops, pharmacies and cafes reflect on the windshield, Bradley pauses. "I'm proud of what we accomplished," he finally says. "I'm proud of what we did." Bradley knew that Egypt had been one of Africa's most talented teams. In his five years leading the U.S. program, Bradley's teams won a Gold Cup, defeated top-ranked Spain to reach the Confederations Cup final and won a group stage in the 2010 World Cup. But a mediocre showing last summer, highlighted by a 4-2 loss to Mexico in the Gold Cup final, prompted U.S. Soccer to make a change. Bradley was out, easily cast aside as too serious, too boring, too unimaginative. German Jurgen Klinsmann replaced him, billed as Bradley's entertaining, outgoing, open-minded opposite. No matter what I say, Bradley won't touch any of it. There's no trashing of federation president Sunil Gulati or anyone on the board. There's no complaining about this player or that one. It's obvious Bradley isn't happy with the way things ended in his home country, but he refuses to go there. So I head in another direction: Why Egypt? Bradley's explanation: He didn't really have a choice. "If after I was finished with the U.S., if I really felt at any point there was going to be some real legitimate opportunities in Europe, then I might not have been so quick to come here," Bradley acknowledges. But such opportunities never came. He interviewed for a job at a Mexican club, and his name was mentioned for English Premier League openings at Aston Villa and Fulham, but "I wasn't exactly on their A list," he says. The reason he believes there wasn't more interest? An anti-American bias. "Based upon what we did the last five years in the U.S. and the respect people had for our teams and how we played, if I was Dutch or German or French or Spanish or whatever, I'd have gotten coaching offers in Europe," Bradley says as he looks out the car window. "But when you're American, it's just different. You have to fight for respect. It's the same way with the players. That's just the way it is." So when Egypt came calling, he listened. Through Zak Abdel, the Egyptian goalkeeper coach -- and Bradley's goalkeeper coach at Chivas USA and with the U.S. national team -- Bradley knew of the country's immense passion for soccer. And he knew that, despite playing in only two World Cups in 80 years, the country had long fielded some of Africa's most talented teams, winning an unprecedented three straight Africa Cup of Nations titles in 2006, 2008 and 2010. At the same time, he couldn't stop thinking about the message he and Lindsay spent years drilling into the heads of their three children: Don't be afraid to chase your dreams. His dream was to coach in Europe. And if the path there took him through Cairo, so be it. The family was behind him. "We've always taught our kids to follow their dreams and to not be afraid to take a chance on something if it's really what you want," Lindsay says. "Bob has always had this dream of coaching in Europe. It was time for us to follow our own advice. And maybe this will take us there." For Bradley, if his path to a coaching job in Europe goes through Cairo, then so be it. On a chilly, dust-filled night in the Qatari desert, Bradley has finally found a place where the only thing he has to think about is soccer. Or so it seems. His team is about to take the pitch against Congo in the last of three friendlies in Qatar. Fewer than than 1,000 fans are in the 25,000-seat stadium, several of them holding placards that spell, "I [HEART] EGYPT." The team isn't supposed to be here. It was supposed to play in the Red Sea town of Hurghada, Egypt, but the Egyptian government refused to provide security for the matches, so the team was forced to play abroad. As Bradley walks out of the stadium tunnel, he acknowledges the fans across the stadium by holding his hands high above his head and clapping. The fans cheer even louder. After the 2010 World Cup in South Africa, Bradley's name was linked to several coaching jobs in Europe. After the U.S. Soccer Federation let him go in July 2011, Egypt came calling -- and Bradley listened. A few minutes later, Bradley, his coaching staff and players hold their hands over their hearts as the Egyptian national anthem blasts through the stadium speakers. As the fans wave their red, white and black Egyptian flags, I can't help but wonder what Bradley is thinking. His face is expressionless, covered with his familiar no-nonsense glare. I figure that, knowing Bradley, he's probably intensely focused on who needs to be where and why for his team to finish this camp undefeated. The next morning I ask Bradley what he was thinking and his answer is surprising. "When you talk about appreciating and understanding what the people in Egypt have gone through and what they're continuing to fight for and dream about, when you hear that national anthem being played you can't help but feel what this song means for all those people," Bradley says. "And then at some level you start to think about the role our team plays in all of this." The match itself is relatively uneventful, but midway through the first half a dozen or so young men unfurl a sign behind the Congolese goal that says, in Arabic, that it's disrespectful to play the match in the wake of the Port Said tragedy. Another sign reads ACAB, or "All Cops Are Bastards." Within seconds, stadium security and other Egyptians demand that they leave. And on this night, they do. Bradley acknowledges that he saw the confusion, but didn't think much of it. He's instead worried about the way his team played in the final few minutes of a scoreless draw. After a 17-day training camp, his final group of subs didn't appear to learn anything the coaching staff had preached. Back at the hotel, he nibbles on the postgame meal without saying a word, then he gathers his players around him and calmly but firmly expresses his displeasure with their late-game performance. "All the things we've talked about in this camp? For the last 15 minutes, I saw nothing, NOTHING," Bradley says. "And then when the game is over, it's just over to you guys. There's not this mentality that this is a game we should have won. There's not a feeling that this is not enough. And if we don't have that in us, then we aren't going to get where we want to be." He knows this team is in its infancy. The players are getting to know Bradley. He's getting to know them. They teach him Arabic. He teaches them English. And every day they're together is another opportunity to grow. That's why one day after a team meal recently, he asked if anyone had heard of Bruce Springsteen, the rocker who is wired into Bradley's DNA. The answer, of course, was no. But a few players wanted to learn. So Bradley pulled out his iPhone, went on YouTube and started playing "Land of Hopes and Dreams." And just like that, the voice of the Boss filled the air. The lyrics were lost on the players, but through Abdel's translation Bradley tried to explain. "It really fits this whole thing," Bradley said. "The song, in many little ways, fits this whole thing." 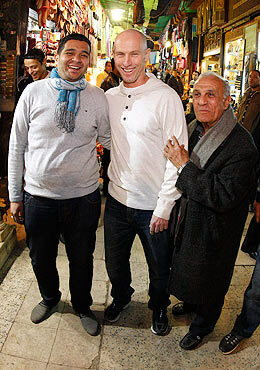 Everywhere he goes in Egypt, Bradley is greeted by enthusiastic soccer fans who ask him to stop and pose for photos. The next morning, Bradley sits patiently at the Qatari airport waiting to board his flight home to Cairo when a stranger plops into the empty seat next to him, interrupts our conversation and hands Bradley his cell phone. While Bradley waits at the gate in Doha, Qatar, a man sits down next to him. Thrilled, the man calls a friend and hands over his phone to Bradley. Other travelers ask for photographs. "It's my friend," the Egyptian man eagerly explains. "Say hello." Bradley shakes his head, rolls his eyes and grabs the man's phone. There's no catch. On the other end is simply some guy who can't believe he's talking to Bob Bradley. The conversation lasts for all of 20 seconds and throughout its entirety the man next to Bradley is glowing. When the call is over, he leaves. "You see this?" Bradley says. "This is what my life is like here." It's been this way all day. When Bob steps off the team bus upon arriving at the airport, a man jumps in front of him and yells, "What about you? What about Egypt?" In the airport, another man stops Bradley to tell him he was at the game last night. "You should have had three goals," he says. A security guard then approaches, extends his hands and asks for a picture. "Must have," he says. "They all say that," Bradley says. After the photo, the man tells Bradley he hopes Egypt makes the World Cup but that the team will need to go through Tunisia to make it. "So you're Tunisian?" Bradley asks. A few seconds later, an Egyptian boy, no more than 8, stands next to Bradley and stares at him. He doesn't speak. He doesn't ask for a photo. He just stands there, completely still. Eventually, his eyes cross paths with Bradley's. The coach smiles. Nods. The boy sheepishly smiles back. And then he turns around and walks away. I mention how that's the first person I've seen recognize Bob and not ask for a photo. "No, he got one earlier by the bus," Bradley says. This is Bradley's life. In Egypt, soccer is king. Egypt's friendly against Congo aired on 12 different channels. A 2011 study found the No. 1 reason for divorce in the country was husbands caring more about soccer than their wives. 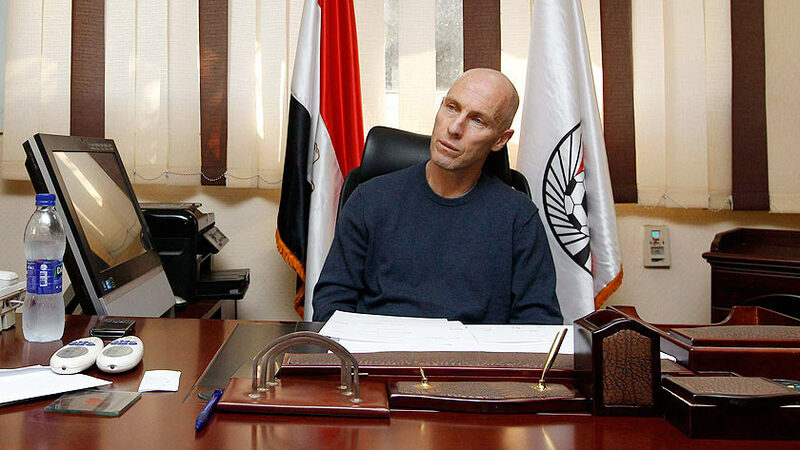 But because Bradley's predecessor was a Mubarak loyalist, hordes of fans lost interest in the national team. Bradley is trying to change that. He needs to change that. If he wants to make the World Cup dreams of the Egyptian people come true, he believes he needs the entire nation behind him and his team. So one fan at a time, one picture at a time, Bradley works like a politician in the stretch run before an election. He smiles. He laughs. He tries to speak in broken Arabic. He's not just a coach. He's become an ambassador. In a way, it's a strange role for an American. According to the Pew Research Center, four out of five Egyptians have an unfavorable view of the United States, and more than half the country wishes it had fewer ties with America. And yet the man they all seem to want to meet is an American. Bradley and his fitness coach, Tomasz Kaczmarek, view game film and do work on the flight from Doha to Cairo. "At first, most people were like, 'We don't want no damn American,'" Abdel says. "They thought Bob was all about fitness. His teams won because they were in the best shape. But now they've gotten to see the man and know the man. And they love him. Now, he's a rock star. He's bigger than Obama." The Egyptians have been particularly impressed about the way Bradley has handled the unstable post-revolution climate. After Port Said, he and Lindsay walked with thousands of Egyptians in Sphinx Square in honor of the victims, and he donated an undisclosed amount of money to the victims' families. He also publicly questioned the motives behind the attack, telling Al Jazeera English, "This wasn't just fans losing control. This has all the markings of a setup, of a massacre." "I couldn't pretend this was something else," Bradley tells me. "It doesn't do anybody any good to just not say anything and pretend this stuff doesn't exist when everybody knows it does." On multiple occasions, Bob and Lindsay have visited Children's Cancer Hospital of Egypt, also known as CCHE 57357. They've taped public-service announcements in English asking for donations while contributing an undisclosed amount themselves. They've also taken daughters Kerry, 23, and Ryan, 20, to the hospital to visit sick children. It's all opened the eyes of Middle Easterners everywhere. "He's stepping into a mine field, but so far he has been on the right side with nearly everything he's done," says James Dorsey, a Middle East expert at Nanyang Technological University in Singapore and the author of the blog, "The Turbulent World of Middle East Soccer." "This is unlike anything any American coach has ever experienced. It's not just football. It's not just team-building. There's so much more that comes into play. And he's performed well. He's pushing all the right buttons." Bradley insists he isn't doing anything differently. He's just being himself. Lindsay agrees. He's always been this way. But I'm not so sure. 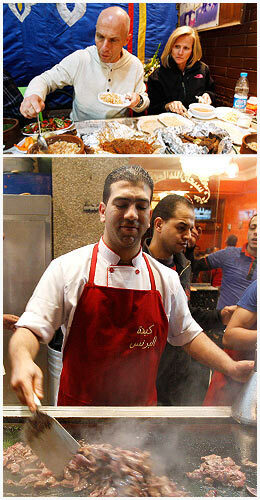 At the very least, Bradley seems to be opening up more to the Egyptian people. When Kerry and Ryan visited from Southern California a few months ago, they saw shades of a new man as well, someone who rode a camel across the Egyptian desert and laughed when a street vendor shuffled hats on and off his head. "It's opened him up a bit," Ryan says. "He's more open to different possibilities now." "It brings out more of my dad's adventurous, free-spirited side," Kerry adds. "That's a good thing." "At first, most people were like, 'We don't want no damn American,'" says Bradley's assistant, Zak Abdel. "They thought Bob was all about fitness. His teams won because they were in the best shape. But now they've gotten to see the man and know the man." At the end of a typically exhausting, stress-filled day, Bradley has found his happy place. He's sitting in the corner of a bustling Egyptian restaurant in Cairo's vibrant Imbaba neighborhood, his stomach churning from the lime green mulukhiyah he's just finished. He's smiling not because of the yogurt shake and rice pudding. He's smiling because of the person sitting to his left. It's Lindsay. In the airport a few days earlier, he couldn't stop bragging about his wife, how he couldn't do any of this without her, how she's the most selfless person he's ever known. She's sacrificed everything -- her family, her friends, her life -- so he can chase his dreams. For years now, Bob has had a running joke about how she could have married some rich man and had a life of luxury at the Baltimore Country Club. Instead, they've spent 4th of Julys in sweltering summer heat watching Michael play youth soccer. They've spent hours in sweat-filled indoor facilities absorbing the stench to watch Kerry and Ryan play. And now, well, she lives in Cairo. Bradley and his wife, Lindsay, have embraced the Egyptian culture, often dining on Egyptian cuisine like they did this night at Kebdet El Prince in Cairo. "He's always said that," Lindsay says. "I just roll my eyes." "I'm a lucky man," Bradley says, "I completely out-did myself. She's amazing. Now the key is don't f--- it up." Between bites, Bob turns to Lindsay. "You OK?" he asks. He does this all the time. When he's climbing the rocks outside of Egypt's pyramids. When they're surrounded by Egyptians at a street bazaar. When they're walking on the street and for some reason get separated by a few paces. He stops, turns and asks if she's all right. On this night, Lindsay leans in, puts her head on her husband's shoulder and smiles. When she lifts her head, the two look into each other's eyes. They don't say a word. They just smile. A few minutes later she spots a speck of food in her Bob's teeth and digs it out. "You know you're the only woman in the world I'd let pull mulukhiyah out of my teeth," he says, laughing. Bradley's parents back in New Jersey are less than thrilled about their son's choice of residence. And there are other family members and friends who worry about Bob and Lindsay's safety. After all, there is no security detail. The hotel has a metal detector. And the silver Kia has door locks. That's it. When I ask Bradley about the lack of protection, he shrugs. Part of it is his personality. And part of it, I surmise, is his goal of being one with the people. "Security is the last thing you worry about here," Bradley says. "Sure, there are issues. But with everything that goes on here, it doesn't impact the vast majority. There can be a protest going on in Tahrir [Square] and you don't even realize it. People are out working and trying to take care of their families." Explore a gallery of photographer Ross Dettman's images. The morning after he returned from Doha, Bob and Lindsay sit at their usual table in the back of the hotel restaurant and eat breakfast. The waiter brings yogurt and glasses of orange juice because one day, a few months ago, Lindsay casually mentioned she enjoyed yogurt and orange juice. All of a sudden, the entire staff shows up with something else -- a pink and white birthday cake. The day before was Bradley's 54th birthday. But since he was away with the team, the hotel staff has waited until today to surprise him and celebrate. There's only one problem: Bradley hates birthdays. "Some of the best birthdays are the ones where you go through the entire day and nobody knows it's your birthday," he says. "Now today I get this." As the hotel staff sings "Happy Birthday" in Arabic, Lindsay can't stop laughing. She knows her husband hates this. "You're a good sport," she says while they sing. "I can't stop thinking how this so isn't you." 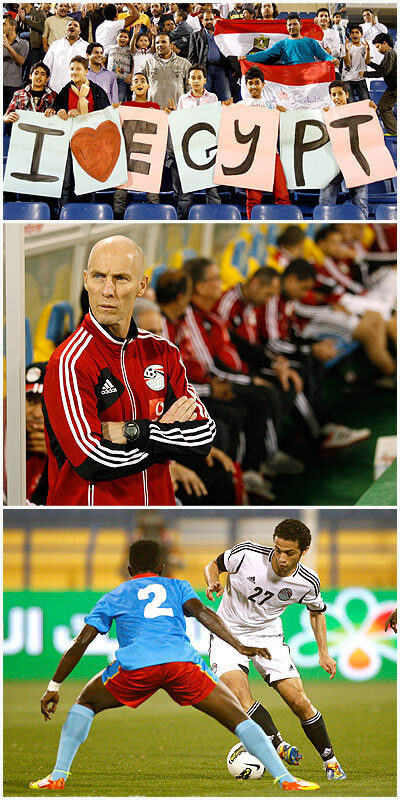 Questions still remain, even as the Egyptian team succeeds under Bradley. What happens if the team starts to lose? Will the Egyptians stand by Bradley? "No," Bob says. "It isn't." But Bradley plays along. When the song comes to an end, he smiles and laughs. There is of course a group picture. And then one of the waiters leans in and kisses Bob atop his head. "You take Egypt to the moon," he says. "You're only as good as your last match," Bradley replies. "We need to play some good teams first." A manager tells Bradley that he watched the friendly against Congo and the team looked good. "I see you on TV," he says. "You stand like a lion." Bradley isn't quite sure how to respond: "Well," he says, "I'm watching the game." It's all positive now. But that doesn't mean Lindsay doesn't occasionally worry. It's her nature. When she watches Michael's soccer games from Italy, her body transforms into a tightly-wound rubber band of nerves. Between bites of fruit, she concedes that she's worried what might happen if the Egyptian team doesn't win and the attention isn't all positive. The next night, when we're walking in a Cairo bazaar, a man stops Lindsay and tells her how happy the country is about her husband. "For now," she replies. When Bob is away with the team, Lindsay sometimes flies to Italy to see Michael or heads to the United States to visit other family. But more often than not, she enjoys a quiet existence in the Zamalek neighborhood, keeping to herself as she quietly sits at a corner coffee house or strolls through the aisles of the neighborhood grocery store. When a match begins, she sits in front of the television by herself, a nervous wreck. "Sometimes, I can't help but think this is all so overwhelming," she says. "These recent friendlies, I was like, 'Please God, please God. I don't know these African teams. I'm so nervous. Please God get a result so everyone here is happy.' Bob doesn't worry. He just says we do what we can do. Well, that's great." Abdel shares Lindsay's concerns. He knows the volatility of the Egyptian people. When the former goalkeeper surrendered a soft goal during a league match several years ago, fans broke into his father's electronics store and destroyed every TV and VCR in the place. At some point, Abdel knows there will be adversity. And when there is, will the Egyptians still stand behind Bradley and the team?
" He pauses. "We could have a hard time. They could make it difficult for us here." So far, Egypt has lost just one of the 10 matches Bradley has coached. The honeymoon has stretched for eight months. But aside from Bradley's first match against Brazil, a loss, the matches have all been hand-picked friendlies. Come next month, the pressure will rise. The matches will count. World Cup qualifiers with Mozambique and Guinea loom, as does a home-and-home Africa Nations Cup qualifier against Central African Republic. For security purposes, the home matches will likely be played in empty stadiums. And Bradley will hold longer training camps than normal in hopes of overcoming a lack of activity that has plagued the team since the cancellation of the Egyptian Premier League in February. The most recent FIFA rankings have Egypt as the 57th team in the world, No. 9 in Africa. Only five African teams will qualify for the 2014 World Cup. As Lindsay starts to think about everything her husband is battling, she sighs. She stops eating. Her mind wanders. She looks at Bob and asks what a new set of bosses might mean for his future, their future. "Who the hell knows," Bradley says. Clearly, he doesn't share his wife's concerns. That's not him. Instead, Bradley stays emotionally consistent. Sure, he could be fired tomorrow. Sure, a series of post-revolution protests could break out on his drive to the office. But Bradley doesn't worry about any of that. Perhaps that lack of fear is the exact reason this crazy experiment just might work. Or perhaps it's the reason it could all go wrong. "Maybe six months from now we'll look back and people will say I tried to do things in Egypt that would never work. And I'll look at them and be like, 'You know what, you were right,'" Bradley says. "But at the same time, maybe not." Wayne Drehs is a senior writer for ESPN.com. He can be reached at wayne.drehs@espn.com. Follow him on Twitter: @espnWD. Join the conversation about "Soccer in the Storm"
Is he Guerdwich Montimere? Or is he Jerry Joseph? If only it were that simple.